Daytona start pushed back to 7 p.m.
NASCAR has pushed the start of its season-opening Daytona 500 to tonight, under the lights and in primetime for the first time in its history. Helton made the announcement this morning when it became clear that steady rain at Daytona International Speedway made an evening start the best option for NASCAR’s marquee event. Helton also said Tuesday has not been ruled out. Heavy rain all day Sunday forced NASCAR to postpone the event for the first time in its 54-year history. If NASCAR gets the race in tonight, aired on Fox, it could produce record ratings for a series that’s coming off one of its most compelling seasons. NASCAR also had a strong SpeedWeeks, marked by the return of pack racing, two new winners in the lower series, Patrick winning the pole for the Nationwide Series race and many multi-car accidents. Greg Busch, executive vice president at GMR Marketing, said ratings for a Monday night race will not better what it would have drawn in its regularly scheduled Sunday afternoon slot. But Busch said the primetime showing will be significantly better than a Monday afternoon race. “This is really the best possible scenario they could have with losing yesterday,” Busch said. “It’s not ideal in the sense that the perfect scenario would be a scheduled race in a primetime network broadcast where everybody knew that was happening. Ed Goren, vice chairman for Fox Sports Media Group, said the network was unsure what to expect tonight. He praised Fox’s production crew for its coverage during the rain delay Sunday, when Fox drew a 4.5 overnight rating despite no on-track action during nearly four hours of air time. “The ratings we got yesterday, it really speaks to the anticipation of what is going to be a great Daytona 500 and a great season,” Goren said. “The challenge tonight as far as ratings is we are in the middle of February ratings sweeps, and there are significant successful shows on other networks. The question becomes, ‘will the loyal NASCAR audience find us?’ The casual fan seems to have caught on Sunday for the storylines and the season, but the casual fan who was with us yesterday, now in primetime, has other options. 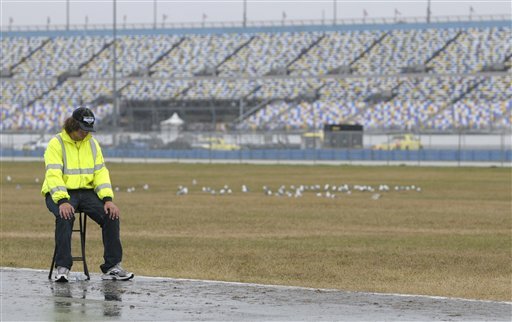 NASCAR officials spent more than four hours Sunday waiting for a window to dry the famed track, but it never came. When the latest storm cell passed over the speedway around 5 p.m., they had little choice but to call it a day. Noontime showers Sunday sent fans scattering for cover and leaving everyone in wait-and-see mode. Puddles of water formed in parts of the infield, and many fans got drenched as they tried to make the best of a less-than-ideal situation.